Americans are consuming too much sugar, and it’s making us sick. The science underlying this statement is strong, and getting stronger all the time. By decreasing their sugar intake, many people could reduce their risk of serious illness. But in order to make decisions that could improve their health, consumers need the facts. They need independent scientific evidence about the health effects of added sugar, guidance on appropriate amounts of sugar in their diet, and accurate information about the added sugar content of the food products they buy. Despite mounting evidence on the harmful effects of excessive sugar consumption, the processed food industry spends billions of dollars each year to mislead consumers and policymakers about added sugar, often targeting vulnerable communities and populations. UCS is exposing these tactics and working to ensure that U.S. dietary guidelines and food labeling requirements reflect science, not industry spin. Consumption of added sugar in the U.S. increased by 25 percent between 1970 and 2000; while consumption has declined slightly since then, it still stands at more than twice the levels recommended by agencies such as the World Health Organization and American Heart Association. In the meantime, scientific evidence linking high sugar consumption to health problems has continued to accumulate. Excess sugar causes tooth decay and disrupts our metabolism in ways that increase our risk of serious illnesses such as diabetes, hypertension, cardiovascular disease, and liver disease. Different foods deliver sugar in different packages—and the differences matter. Sugars that occur naturally in fruits and vegetables are less likely to have harmful effects because they are accompanied by fiber and other nutrients, which slow metabolism (delivering sugar to the system more gradually) and increase feelings of fullness (reducing overall consumption and, therefore, sugar intake). By contrast, sugar-sweetened beverages and processed foods deliver large amounts of sugar quickly, but don't make us feel as full—so we keep eating and drinking. Reducing our added sugar intake would be good for the nation’s health—but not so good for food industry bottom lines. So it’s not surprising to see the industry trying to discredit the science. Using tactics familiar from previous battles over tobacco, processed food giants are misleading consumers with marketing tricks at the same time they work to obscure scientific evidence. Two 2014 UCS reports explain these industry tactics in detail. In Sugar-coating Science, we examine deceptive marketing and labeling practices designed to persuade consumers that heavily sweetened processed foods are actually good for us. 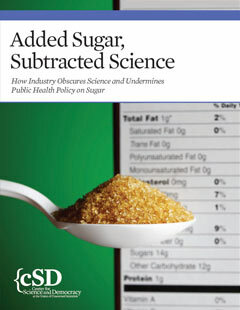 The second report, Added Sugar, Subtracted Science, describes industry efforts to neutralize the evidence on sugar’s harmful effects through a combination of lobbying, PR, counterfeit science, attacks on opposing scientists, and other deceptive tactics. Revising the Dietary Guidelines for Americans to include suggested restrictions on added sugar. This was among the 2015 recommendations of the Dietary Guidelines Advisory Council (DGAC), and UCS has testified in favor of adopting this recommendation. UPDATE: The final version of the Dietary Guidelines, released in January 2016, did include a recommendation to restrict added sugar to 10 percent of daily caloric intake. Listing added sugar on the Nutrition Facts Label required by the FDA on most packaged foods. The label revision proposed by the FDA in 2014 and issued in 2016 includes a line for added sugar, but industry has pushed back hard against this proposal and has asked for 18-month compliance delays which the FDA is considering granting. Commissioning a comprehensive Surgeon General’s report on added sugar and its effects, which could have an impact similar to that of the 1964 Surgeon General’s report on tobacco. Breaking our sugar addiction will not be easy, but it will be worth the effort—and getting our facts straight is a necessary first step.